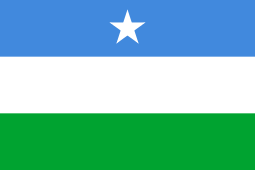 Banaadir (or Banādir, Arabic: بنادر‎‎) is an administrative region (gobol) in southeastern Somalia. It covers the same area as the city of Mogadishu, Somalia's capital. 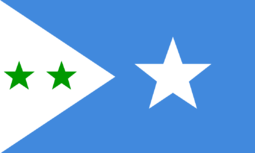 Although by far the smallest administrative region in Somalia, it has the largest population, estimated at 1,650,227 (including 369,288 internally displaced persons) in 2014. Banaadir is bordered by the Somali regions of Middle Shebelle (Shabeellaha Dhexe) and Lower Shebelle (Shabeellaha Hoose), as well as the Indian Ocean. "Banaadir" is derived from the Persian bandar, which means "port", in reference to the coastal cities of Mogadishu and Barawa. The place name reflects the region's medieval position as a key trade center with Persia and the Arabian peninsula. Banaadir is also known for its local breed of goats. 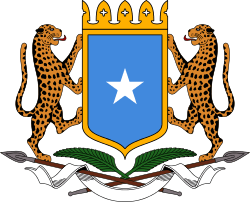 Its capital is Mogadishu, although the administrative region itself is coextensive with the city. 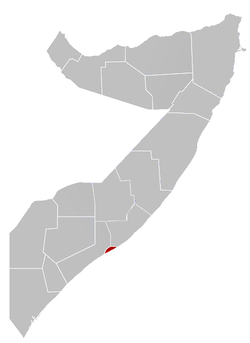 Banaadir is much smaller than the historical region of Benadir, which covers most of the country's central and southern seaboard opposite the Indian Ocean and up to the Juba River, including Mogadishu. Yusuf Hussein Jimaale serves as the current Governor of Banaadir and Mayor of Mogadishu. He was appointed by Somali President Hassan Sheikh Mohamoud to replace Hassan Mohamed Hussein. The 1,650,227 residents of Banaadir are 50.7% female and come from 303,021 households. It has the highest percentage of residents who are internally displaced persons among the regions of Somalia, because of its relative safety and availability of resources. The Banaadir region consists of seventeen districts. Warta Nabada District was previously known as Wardhigley District until it was officially renamed in 2012. Kadha District was formed in 2013 and is still absent from most maps. ↑ "Somalia". The World Factbook. Langley, Virginia: Central Intelligence Agency. Retrieved 23 March 2015. 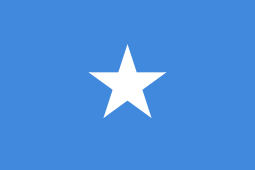 1 2 3 "Population Estimation Survey 2014 for the 18 Pre-War Regions of Somalia" (PDF). United Nations Population Fund. Retrieved 23 October 2016. ↑ Njoku, Raphael Chijioke (2013). The History of Somalia. ABC-CLIO. p. 69. ISBN 0313378576. Retrieved 14 September 2014. ↑ A, Abdirahman (26 October 2015). "Somalia: Mogadishu mayor sacked in Roadblocks row". Horseed Media. Retrieved 23 October 2016. ↑ Somali president renames Mogadishu district to foster peace, SabahiOnline.com, 10 April 2012. Accessed on 23 October 2016. ↑ See: "Somali Voices" Radio Program Connects Families, Fosters Dialogue on Tough Issues, Internews, 27 February 2014. Accessed on 7 October 2015.